“One can earn more money, but not more time!” – I have no idea who said this, but I think I saw it on Instagram somewhere, and it captures the idea of the value of time. About a month ago my wife wrote an article about how being focusing on being frugal can lead to a sinful attitude she named “frugally proud“, where you gain a sinful pride out of how cheap you can be, despite the costs. She was inspired by a show that we watched a few times on Netflix called, “Extreme Cheapskates”. 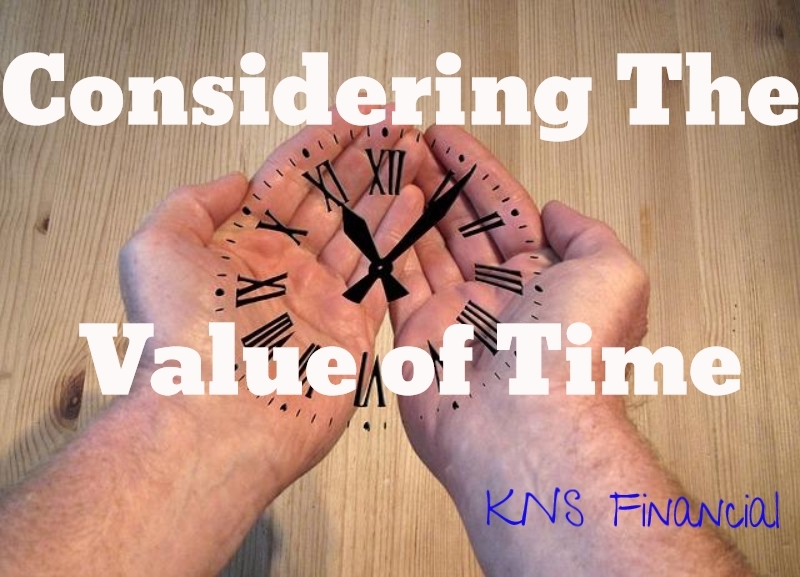 Watching that show has made me reflect on one of my biggest pet peeves – not considering the value of time! These people are satisfied as long as they are able to pay little to nothing for what they want. It doesn’t matter if the cheap way takes them 3 times as long or causes them to use more physical labor or even encroach on others; as long as they save their pennies, it’s worth it. I remember a time where I valued saving a buck at the expense of wasted time. I had such tunnel vision. I was only able to see the lower price that I was paying, and never considered other factors such as the value of time – both mine and others. For instance, I have always despised paying tolls. Unfortunately, I live in New Jersey, and it is pretty much impossible to quickly travel north and south through the state without paying a toll. So, if I had a little extra time I would simply get off at the exit before the toll booths, and ride through the city, and then get back on the highway at the first entrance after the tolls. Sometimes it would only take me a few minutes to get back on the highway; however, with lights, traffic, and the location of and distance between exits/entrances it could take up to 20 minutes to get back on my way! I’m sure that people who are familiar with the Garden State Parkway are laughing at me right now. I did all of that to save $0.25! If it took an average of 10 minutes to get back on the highway, that means that I only valued my time at $1.50/hour (10 minutes is 1/6 of an hour and 6*$.25 = $1.50)! So in this case it made a lot more sense just to pay the toll and save my valuable time! Now I have E-Z Pass, and try to avoid being that cheap. The same is true when it comes to driving around for 10 – 15 minutes trying to save $0.02/gallon in gas. Fill up a 15-gallon tank and you only save $0.30! Did I only value 10 minutes of my time at $0.30? How much time does it take to acquire the savings? Compare that to how much money you will actually save and see if it is really worth your time and effort! Many times you will find that you would be better off spending the normal price and then using that saved time wisely. I believe that valuing time is the major distinction between someone who is frugal and one who is cheap just for the sake of saving a dollar. When trying to decide how far to go in order to pay less money, first figure out how much additional time will be needed in order to realize these savings. Reusing and re-purposing are the new watchwords of the season. Throwing something in the trash is passé. Re-purposing something into a new something is a great way to save some money. Recycling, re-purposing and up-cycling all have similar yet different meanings. Re-purposing your used CDs and DVDs into something new again can save you a little money and create great personalized gifts and craft projects. Damaged or scratched CDs aren’t worth much if you can’t listen to them. Creating fun crafts and party favors are a great way to add interest to a dinner table or themed event. Create stylized and entertaining place card holders for a musically themed or movie themed party. Choose among your damaged or duplicate CDs with artists and titles that suit your guests’ personalities. Create CD labels using free software and purchased CD labels. Label each one with a guest’s name, affixing it to the damaged media side of the CD. Place the CDs with artist side up at each place setting. As the guests arrive and through the cocktail hour leading up to the dinner, have them review the potential seating arrangements. As dinnertime approaches, have each guest pick a first and second choice as to who they think the artist is that most represents them. When it is time to sit, enhance the game by having each guest stand or sit at their selected artist location. If they are right, they stay seated and if they are wrong, they change places with the correct person identified on the back. Continue until all guests are seated correctly. This activity should take approximately five to ten minutes depending on the quantity of guests and their level of participation! This is great fun and interesting dinner conversation. CDs and DVDs have holes in the center, not large enough for a napkin but certainly large enough to slip a ribbon through and tie a pretty bow. Fold napkins in a fan shape, secure with a ribbon in a simple knot and slip the tails of the knot through the center of the CD from the back. Tie a pretty double bow to secure the CD to the napkin and place at each place setting. Prior to attaching to the napkin, do a little homework on each artist, such as living or dead, DOB, birth place, most famous song, number of hit singles and other interesting facts. Put all these facts together on a CD label and affix to the media side of the CD. During dinner, guests share their artist trivia. It makes for wonderful dinner conversation, especially when some of the dinner guests are new acquaintances. CDs can add life to simple place settings or dessert plates. Use damaged CDs at each place setting as an interesting music themed coaster for wine glasses (you can try this with damaged money, but it probably won’t go over so well). For more formal dinners with sorbet or a chilled first course, use CDs as doilies for serving plates. Used CDs and DVDs can also double as mini place-mats for ice cream or other frozen desserts served in stemmed goblets. No crafting is required, but your guests will be impressed with your ingenuity. If you are looking for a few extra dollars to help flush out your holiday party budget, gather all your CDs and sell them. There is definitely no crafting involved here. Check online for buyers, pack them up and ship them off. The newest way to thin your collection and make a few bucks, selling CDs online, can be a very profitable venture if you have the time to create the ads or develop a website. You will be a musicmagpie CD selling success in no time. A few nights ago a big storm rolled through and rain poured down. I lay in bed listening to the rain pound on the roof and felt a huge sense of luxury and appreciation that I was warm, dry and comfortable in bed instead of out in the rain. It got me thinking that, though there are hardships, things we don’t have and areas for improvement in all of our lives, by and large we are incredibly fortunate. When I go to buy groceries each week I can buy enough to feed my family without worry. I can walk to the store because I am in good health. I have access to good health care that I can afford. I live in a country where you can get a free education through high school, often one that is of excellent quality as was my experience. When it is cold outside I have shelter, heat, blankets, and tea or hot cocoa to keep me warm. When it is hot I have fans and cool water to drink. I have clean water for drinking, cooking and bathing and a sanitary way to dispose of waste and use the restroom. If I want to talk to my family or friends I can just call or email. If a family member fell ill I could be on a flight to see them the same day. Listing it all out I feel incredibly lucky to have all of these advantages though I know that on a day to day basis I might take some or all of these completely for granted. I think stopping and truly appreciating what I do have helps me feel more content and want fewer things in general. After thinking about this as I nodded off to sleep that night I felt at peace and the constant to-do list in my head got quiet. The next day I appreciated the sunshine, the good weather, my morning caffeine fix and breakfast without feeling the least bit deprived. When I hit that level of contentment the idea of decluttering my life, buying less and putting away a little more of my money seems simple and obvious. I don’t feel like I need new clothes, ice cream cones, far away vacations, concert tickets or dinners in restaurants. Instead I crave time and flexibility. I want more time with my SO, I can never seem to get enough, and the flexibility to just take a day off to spend together on impulse. I want quality time with friends and family without errands nagging at the back of my mind. I want time and flexibility to pursue project ideas that have sat idle for too long. That time and flexibility is exactly what saving buys you once you reach financial independence in my mind. Not that you would stop working, but that you could do so closer to your own terms and interests. The contentment also enables you to cut your spending to increase your savings and reach the goal faster. So I wonder if there’s a way to take this content mindset and extend it. Take advantage of it for weeks, months, or even years. It feels happy and good and would be good for me but I don’t know if I can make it last. As I continue to work towards my goal of graduating debt-free, feeling content with what I have becomes increasingly important and it will be even more important when I graduate so I don’t fall prey to lifestyle inflation. Contentment, I think, is a great tool to combat frugal fatigue and burnout, something I’m worried about over the next two years. Though I’ll be paying for my first year of business school in cash, I have a long way to go before I can be certain that it will be the same for the second. A little extra saving and a little less temptation to spend would be helpful to me in my graduate student lifestyle. Overall, I’m committed to keeping debt out of my life, it hinders the freedom, peace and contentment that I’m trying to achieve. What brings you contentment in your life? Do you have moments where you appreciate the very basic comforts in your life? Do you think that feeling helps you be more frugal? How can I consistently appreciate what I have? Every year people empty their wallets in order to impress their spouses – I won’t make this a rant about February 14th only because my wife will probably read this 😉 ! Most people I know will spend well over $100 for a Valentine’s Day gift. Add in dinner, dessert, traveling, lodging, and entertainment, and you’re sure to whip out a credit card just to handle it all! 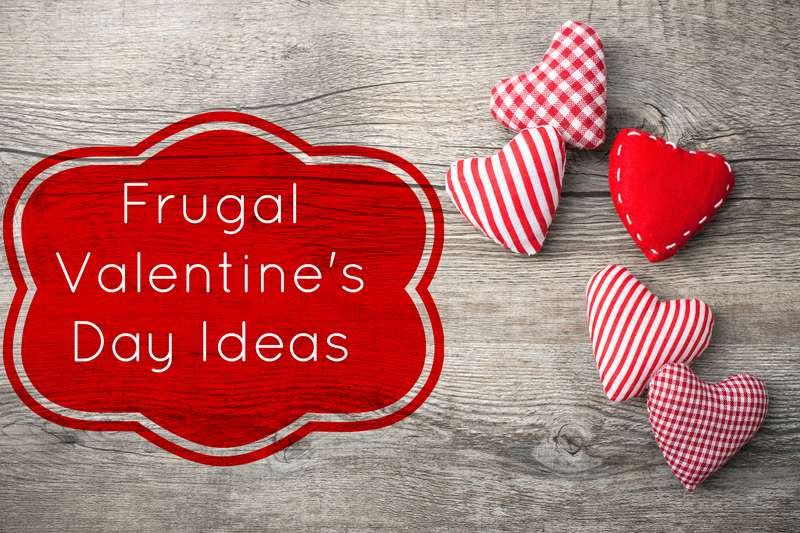 Below you will find a few frugal Valentine’s Day ideas to help your wallet feel a little love. There is no rule that says that you have to go out to enjoy a romantic evening! You can get all dressed up and have a wonderful, romantic dinner at home. If you really want to enjoy the atmosphere of an expensive restaurant, you can have dessert or coffee there, after you enjoy your meal at home! Some people love cooking special dinners, but if you think that the prep work may drain you before the evening even begins, just pick up something from a local restaurant. There are actually a few frugal Valentine’s Day ideas that you can incorporate into dinner, but those were just a few. I must admit that I hate the markups that come around Valentine’s Day! Once the paper hearts are hung, you will pay double or triple for flowers, candy, jewelery, and even meals! However, if you wait until the following weekend, then most of those prices will be back to normal! Out of all these frugal Valentine’s Day ideas, this is the one that I practice every year without exception! If February 14th happens to be on a weekday, then stay home from work and use the entire day to celebrate! Actually, since my favorite of all frugal Valentine’s Day ideas is to celebrate on another day, then my suggestion is to combine these tips. Take the following weekend to celebrate, and then take a vacation day on that Monday! Then you’ll have a chance to incorporate many of these tips (and the ones suggested in the comments below)! Many colleges and universities offer free shows during the semester. These concerts are usually performed by the music majors, and are at a pretty high level. If there isn’t one directly on February 14th, then choose a night close to it (see above)! I really hope my wife doesn’t see this. You can write a poem or a love letter to your spouse. If you have musical talent, then try writing a love song to them – or at least singing one that captures your feelings! You can even make a video expressing your love! Just be creative, but be sure to do something from the heart. If you live in an extremely cold climate, then this may not be for you. But if the weather and temperature permit, go for a walk under the stars. This is one of my favorite frugal Valentine’s Day ideas! Couple this with having dessert and/or coffee at a fancy restaurant, and you’ll make the night even more romantic! Gather together all of your favorite love songs and create a master playlist! Make sure that it is long enough for dinner, dessert, a little dancing (maybe I just shouldn’t show this article to my wife at all), and other extra curricular activities. Give a gift from the heart. Honestly, I hate buying flowers and other traditional gifts…because they are so “cliche” and have lost their umph (yes, that is a technical term)! Homemade gifts make great statements of your affection! 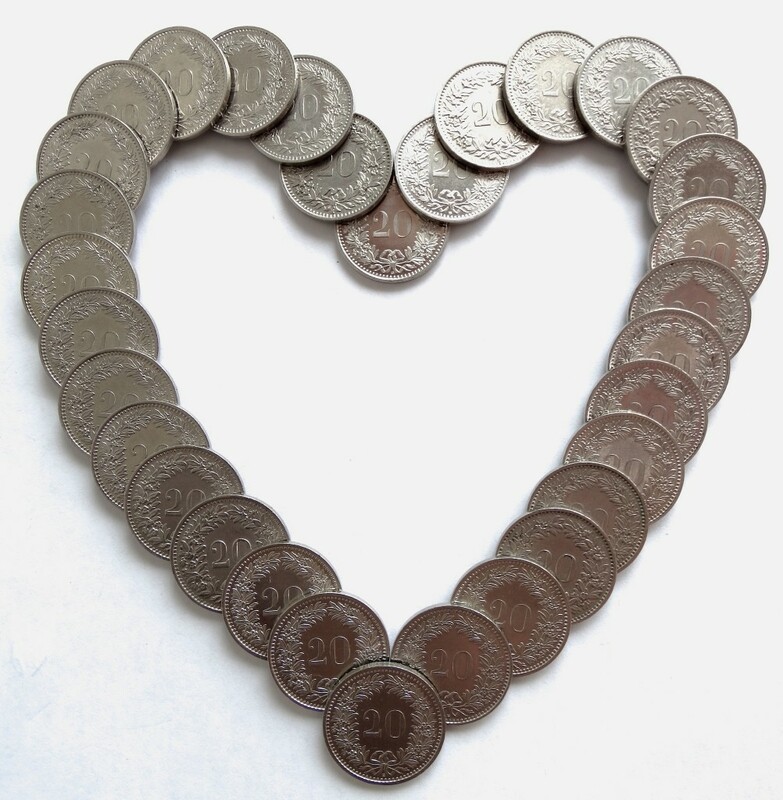 Remember, when coming up with frugal Valentine’s Day gift ideas, creativity is the key! Something that is fun to do is to create coupons or gift cards that your spouse can redeem for various things from you. You can offer a massage, running errands, cooking their favorite meal, etc. Take your favorite pictures from your wedding and make a slide show out of them! You can also take pictures from your dating days, and other special events in your lives together, and include them as well. Be sure to have good music picked out for the slide show. This is more of a general idea. Whenever you create something that expresses your love, or find something that captures a memory, put it in a scrapbook. Then, every Valentine’s Day, take it out and look at it together! My wife keeps EVERYTHING – playbills, ticket stubs, receipts, everything that will help us remember special moments together…and I love it!!! So, what are your ideas (please keep it “family friendly”)? What creative things have you done to demonstrate your love, without emptying your bank account? Be sure to check out frugal Valentine’s Day Gifts from Amazon.com!